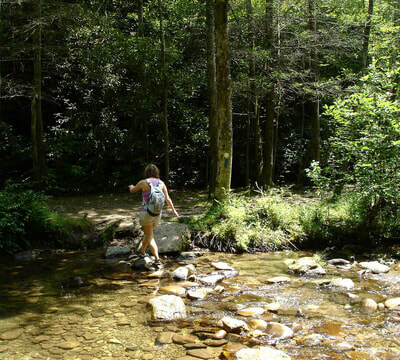 Wilson Creek Cabins Favorite Hiking Trails! 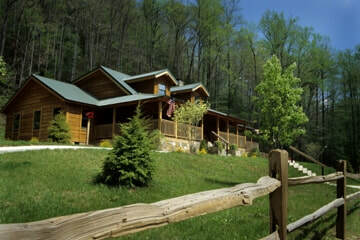 Pet friendly cabin rentals "Wilson Creek Cabins" are surrounded by 49,000 acres of Pisgah National Forest and there are excellent trails right behind each house. The mountain behind us is the Joe White Trail and Wilson's Ridge with views of Grandfather and Brown Mountain area. Wilson Creek Cabins are 13 miles from Blowing Rock or going a different direct about 14 miles to the Blue Ridge Parkway near the Linn Cove Viaduct! Once on the Parkway there are bunches of trails heads and lots to see. The ones we have here are somewhat close, for other great excursions check out our Must-See Destinations page! 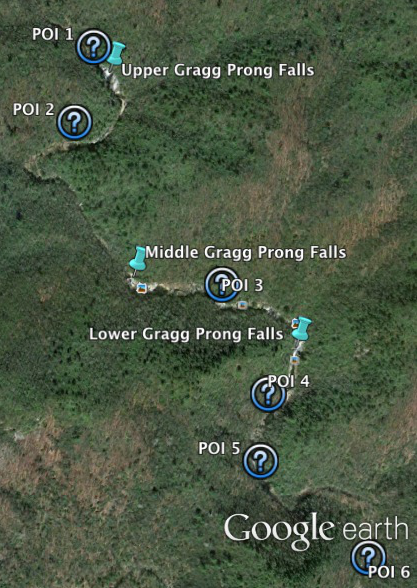 The trails in the Wilson Creek area are generally rugged, so be prepared. Most are signed at trailheads and a few have internal signs or blazes on the trees. The descriptions below are for a few of the more popular waterfall trails. Use these descriptions in conjunction with a map of the area (available at the Wilson Creek Visitor Center or from the U.S. Forest Service). The Mountains-to-Sea Trail, blazed with white circles, crosses through the area. 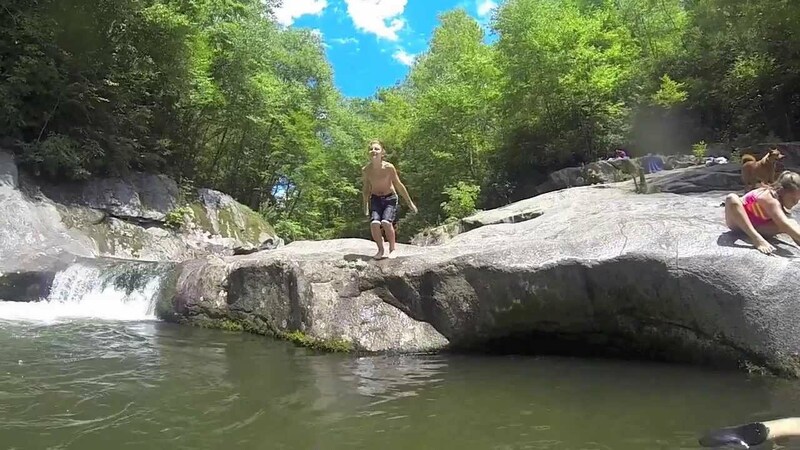 Being one of the more popular hikes in the area, you get double waterfalls at Harper Creek starting at 40 feet. 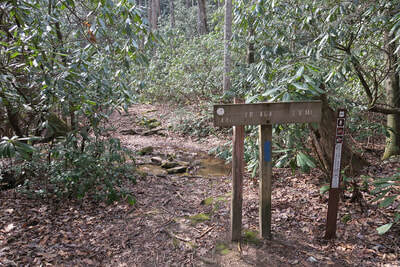 This walk is an easy to moderate hike and takes about an hour one way 7.3 miles. 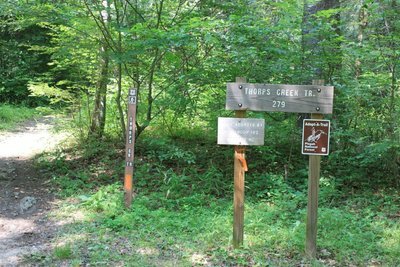 The trailhead is about 2 miles north of the Wilson Creek Visitor Center on Brown Mountain Beach Road. Follow the creek until you get to the waterfall. The trail is blazed in orange. There is a parking area at the trailhead. This trail is one of the more scenic trails in the region. 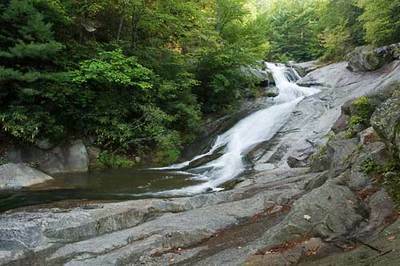 There are three falls along this route with several easy to difficult creek crossings. 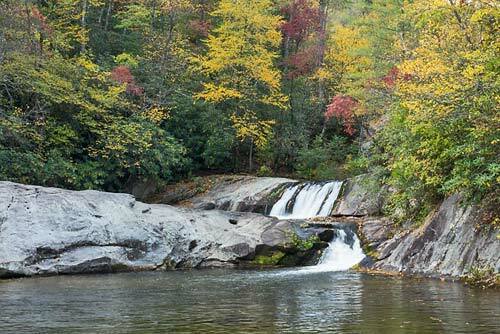 The trail reaches the Upper and Lower Gragg Prong Waterfalls and Hunt-Fish Falls. This trail is part of the Mountains-to-Sea Trail and is marked with a white blaze. From Brown Mountain Beach Road, turn left on N.C. 90. Follow N.C. 90 for 2 miles to Roseboro Road (SR981). Turn left on Roseboro Road and go 4 miles to a bridge. A small parking area is just beyond the bridge. 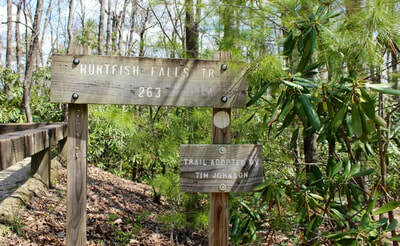 Hunt-Fish Falls is a wonderful destination for more advanced hikers. The trail winds down a scenic cove to a 20-foot waterfall and becomes very steep at the end. The length of the trail is .7 miles. 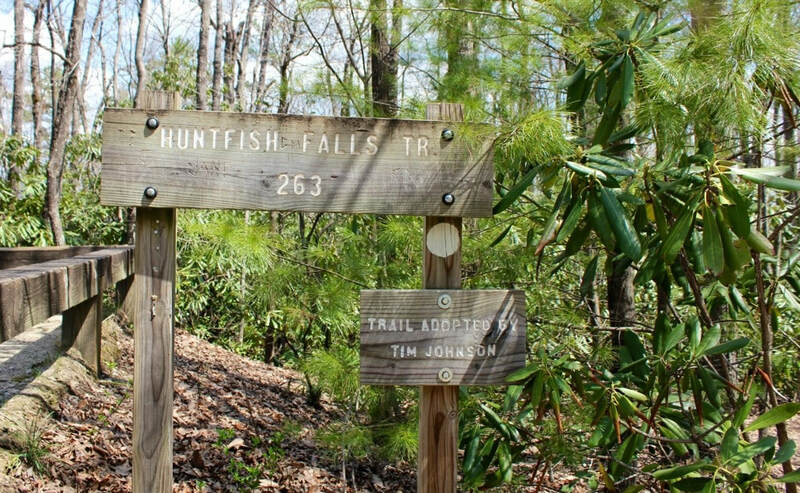 The trail intersects with Lost Cove Trail above Hunt-Fish Falls, which provides several opportunities to connect to other trails for longer hikes past Hunt-Fish Falls. From Brown Mountain Beach Road, turn left on N.C. 90. Follow N.C. 90 for 1.8 miles to Pineola Road (SR464). Turn left on Pineola Road and go 3 miles to a marked parking area on the right. 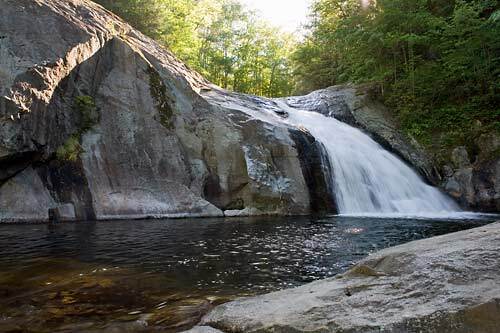 Hunt Fish Falls via Gragg Prong is a 5.6 mile moderately trafficked out and back trail located near Roseborough, North Carolina that features a waterfall and is rated as moderate. 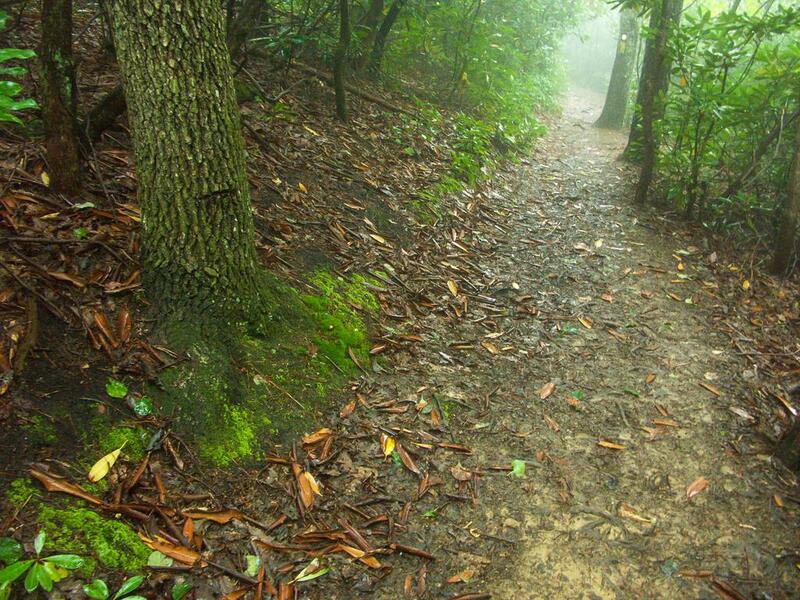 The trail is primarily used for hiking, walking, nature trips, and birding and is best used from June until September. Dogs are also able to use this trail but must be kept on leash. This waterfall is easy to get to and is excellent for beginners. The trailhead starts at the back end of the Mortimer Campground and follows Thorpes Creek. 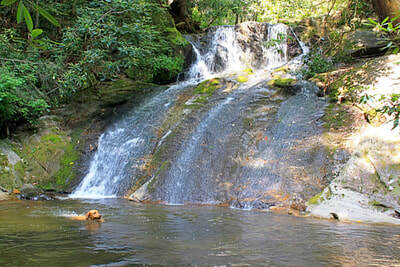 This 15-foot, cascading waterfall is about 1 mile hike to the falls from the trail head. From Brown Mountain Beach Road, turn left on N.C. 90. Mortimer Campground is on the right. Follow the road through the campground and park at the end. From there the Trail head is right there and short 20 minute hike up stream is a gorgeous water falls and swimming hole, check it out for the whole family. Prepare to be blown away! From Pet friendly Cabin rentals Wilson Creek Cabins drive is about 45 mins to the parking area near the top, from there, there are trail heads in all directions - to the top, down into the Linville Gorge and to several peaks surrounding the Table Rock Park -hiking paradise found! Moderate to Hard!